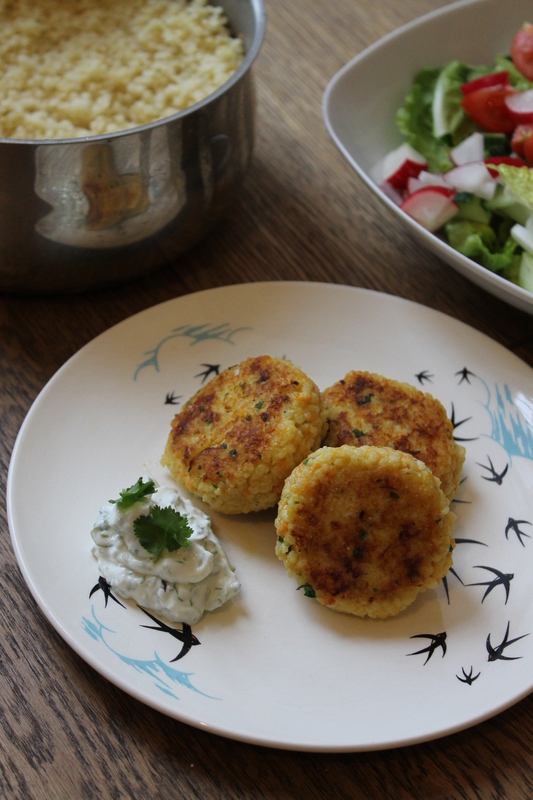 I recently rediscovered Millet Croquettes, I’d forgotten how much I loved them and how tasty they are. I think we used to have them on a weekly basis as children growing up in a macrobiotic household. Millet, which you can find in health food stores, is super healthy, gluten free and easy digestible. It’s a great alternative to rice or pasta and is easy to prepare. It also tastes great, no wonder parakeets like it so much! Millet works well as a base for patties as it holds its shape well. I made this recipe with grated carrot, shallots and Parmesan but feel free to experiment. This recipe is also a great way of using leftover cooked millet. My daughter really enjoyed eating these croquettes. I’m hoping she will continue to love them just as I did when I was a kid as they are so good for her. For us adults, I served them with a yoghurt & fresh coriander dip and a salad. The easiest way is to bring 1 cup of millet to the boil with 2 ½ cups of water. Reduce the heat to low, cover and cook for 15 minutes. Set aside and leave to rest uncovered for about 20 minutes. This will make approximately 3 cups of cooked millet. Fry the chopped shallots and garlic in a little olive oil until softened. Add the grated carrots and take off the heat. In a bowl whisk the egg and add the carrot mixture and all the remaining ingredients. Mix well and using your hands shape the millet mixture into 9 croquettes or patties approximately 5cm diameter. Heat the vegetable oil in a frying pan over a medium heat. Drop the croquettes once hot and cook for 3-5 minutes on each side until they are golden and crispy.